An essential component of the cuisine, Peranakan snacks and desserts delight with their various shapes, colours, tastes and textures whatever the occasion. Ondeh ondeh brings a burst of syrupy goodness with every bite, while the fragrance of kueh dadar dipped in rich coconut milk is simply irresistible. Pang susi and kueh pie tee are excellent choices for a savoury snack, while bubur cha cha and chendol can be served both hot and cold. Lighter treats like agar-agar, longan tea and green bean or red bean soup will satisfy your sweet cravings and make a great end to any meal. 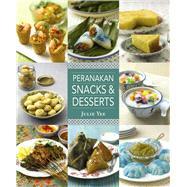 Enjoy all these and more with this delightful collection of Peranakan snacks and desserts by Chef Julie Yee. Chef Julie Yee was born into a Peranakan family and she spent much of her childhood helping her grandmother make Peranakan pastries for sale and cooking for the extended family on weekends. Her passion for Peranakan cooking stems from this early introduction to the cuisine and she enjoys experimenting to find more efficient ways to prepare traditional dishes. After graduating from the National Institute of Education (NIE) as a Home Economics teacher, Chef Julie went on to take a diploma in baking and continually works on improving her skills by taking up professional courses such as Advanced Bread Making, Petits Fours and Cake Decoration and Modern French Pastries. Chef Julie has been running Julie's Baking Lab for more than a decade and she contributes recipes regularly to Lianhe Zaobao.